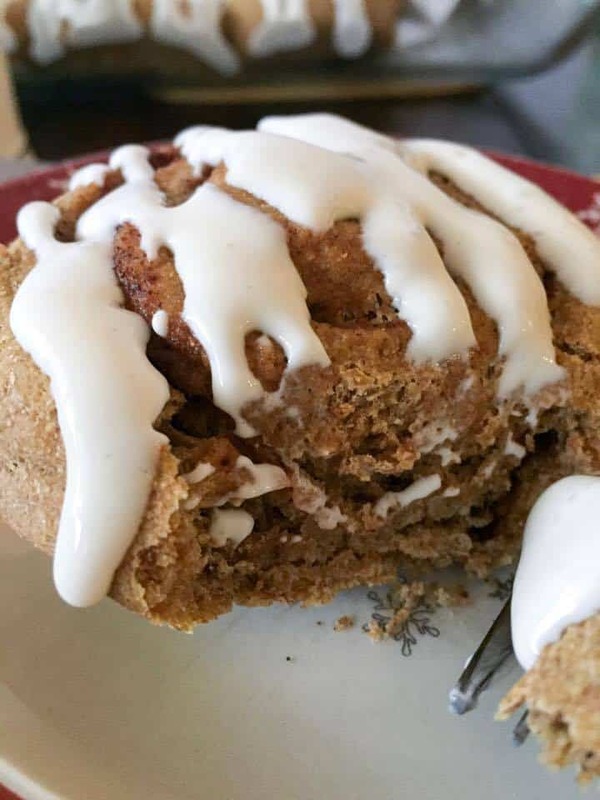 Delicious, gooey pumpkin cinnamon rolls that are Trim Healthy mama friendly! And whats more – they are an “E” fuel! Cinnamon rolls are a comfort food in my book. Nothing quite compares with a steaming, fresh cinnamon roll hot from the oven. I’ve made quite a few (un-healthy) cinnamon rolls in my day. 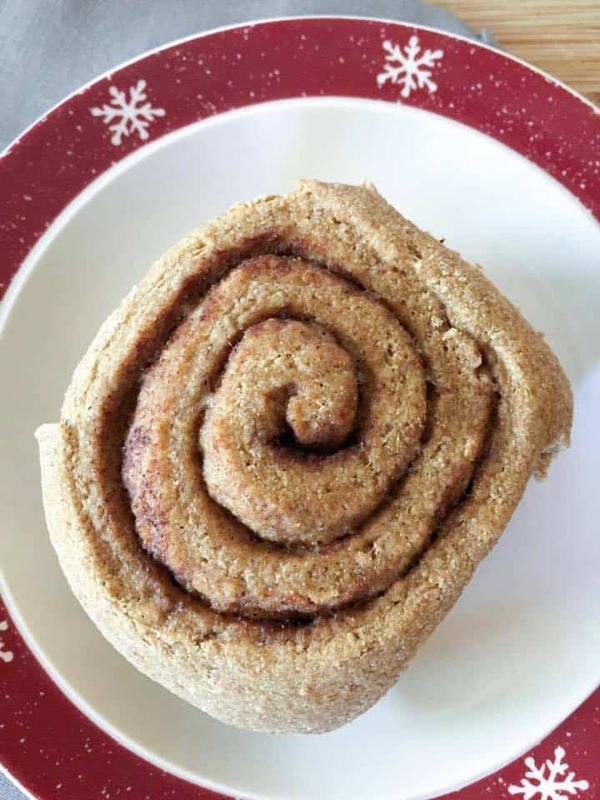 So that is why I am so excited to give you this healthy, THM cinnamon roll! I have tried cheese dough cinnamon rolls, and while those are good, I wanted a real “bread” texture for these. 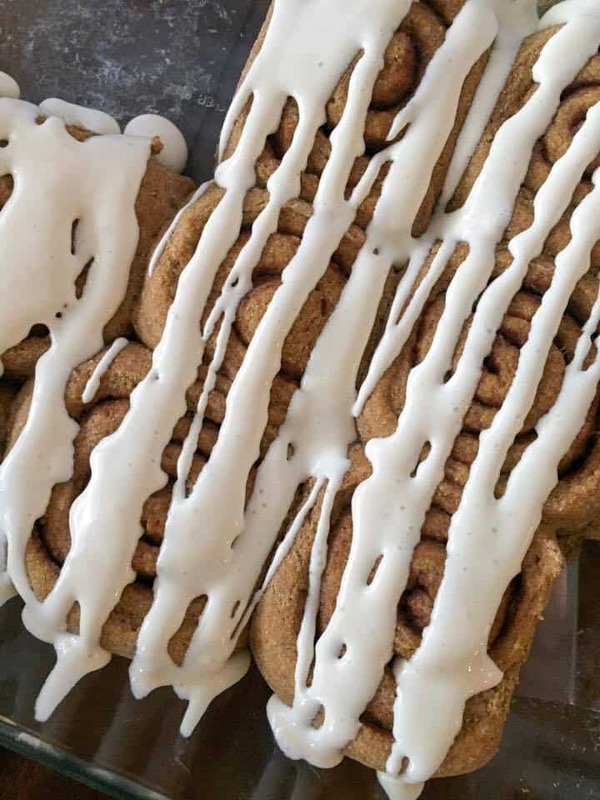 And, since it is still the season of all things pumpkin, why not make them pumpkin cinnamon rolls? Sounds like a winner to me! If you have never worked with yeast or bread dough, don’t let it intimidate you. It really isn’t as hard as you may think. And oh, the smells that come wafting out of the oven! It smells so delicious and comforting! Now, about the frosting – can you guess the secret ingredient? Go ahead, guess! COTTAGE CHEESE! Now, hold on just a minute. Hear me out here! I am aware of how positively horrible that sounds! But actually, once it is blended, and the sweetener and vanilla are added, you wouldn’t know that it was cottage cheese. Believe me, I used to hate cottage cheese with a passion! 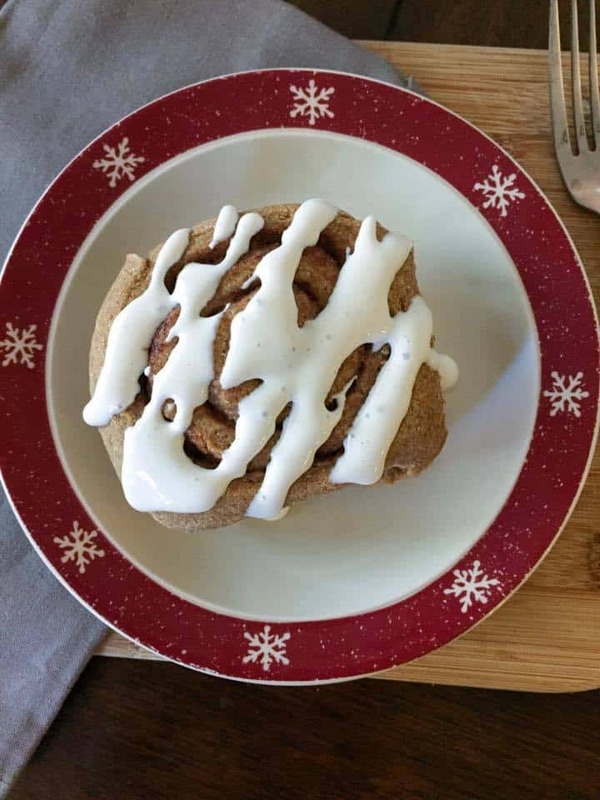 The low fat content of cottage cheese makes it the perfect topping for these “E” fuel cinnamon rolls! 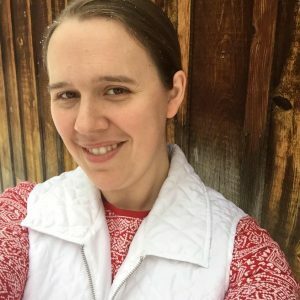 I am aware that I may lose a few readers right here, but please at least try it! My seven year old daughter, (who HATES cottage cheese) was asking to eat this frosting with a spoon! But you can always have your cinnamon rolls un-frosted, too! Now, a small disclaimer about these rolls. Because of the sprouted flour, they are not like “normal” white flour, sugar filled cinnamon rolls. However, I find that they taste delicious, and certainly help to fill that cinnamon roll void in my life! They are best when served warm – give them a try! In a small bowl, combine warm water, yeast and honey. Stir until dissolved. Let stand for 5 minutes. In a few moments, you should begin to see bubbles form on the top of the water (this shows your yeast is working). In the bowl of a stand mixer, mix flour, salt, cinnamon and xylitol. Add yeast mixture to flour mixture and mix with the dough hook attachment. Add pumpkin and melted butter and continue to mix until dough form a soft ball. Turn dough onto a lightly floured surface and knead 10-15 times, or until smooth. Let rise for 1 hour, or until doubled in size. On very lightly greased parchment paper, roll dough out into a large rectangle shape. 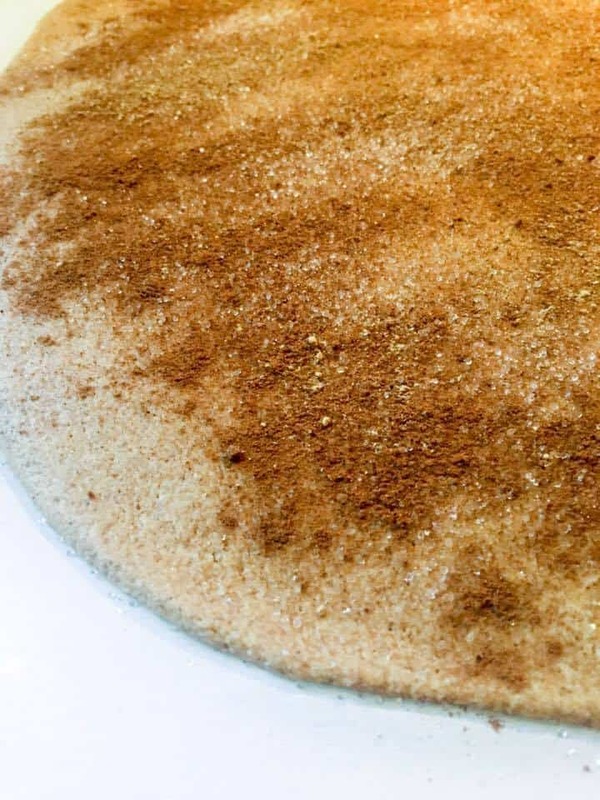 Sprinkle with additional xylitol and sprinkle generously with pumpkin pie spice. Roll up jelly-roll style, and slice into 12 rolls. Place rolls in a 9x13 dish and allow to rise a second time, until nearly doubled in size (about 1 hour). Bake in a 350 oven for 20-25 minutes, or until tops begin to turn golden brown. In a small blender (I use my single serve Ninja), combine all frosting ingredients and drizzle over rolls. These are best when eaten within a day or two, as they seem to dry out quickly. I would also highly recommend that you eat them warm. So good! So excited to try these out! Pumpkin is how I roll in the fall and this looks like a great way to use some of my wheat sprouted flour that’s about to expire! I am so jealous of your gorgeous cinnamon rolls! I’ve been trying to make a sourdough cinnamon roll for weeks! They taste amazing, but I just cannot make em look pretty! Well I’m gonna keep trying! Looks good but I can’t use any wheat—-can a yeast type dough like this be made using something other than the sprouted wheat?…..something still THM friendly? Hi! these look wonderful and I definitely want to try them. I haven’t used sprouted wheat before. Used the One Degree brand for my first try. Is it supposed to be super sticky? I kept adding more sprouted flour as I was kneading but it seemed to drink it up and still stay sticky. Thanks! How many of these can I eat fir an E breakfast? (I am asking because I could eat the entire batch… they are so good)! Hmmmm . . . I have not calculated the nutrition info, but I would say you could probably have 2. This beats the purpose of having an E rolls but I am dying (like reaaaally dying!) to make this and I only have the baking blend. Disregarding the fuel type, do you think the blend will work? Trying to get an expert opinion here before I dive in. Thanks. I have never tried to make these with Baking Blend . . . yeast does not generally work well with the baking blend because there is no gluten (so they do not rise). You could certainly try, but I would not use the yeast, and really the whole recipe would need to be re-worked. I would recommend using a fathead-type dough using the baking blend instead. Thank you! Better stick with something that works rather than revamp the whole thing and end up with an inedible mess lol. I will just have to be patient and get sprouted flour from the store. I am not a big fan of fathead dough, it’s just too much of a calorie abuse for me personally.